Our office maintains a significant criminal defense practice and therefore the issue of police Miranda violations is of great interest to the firm. 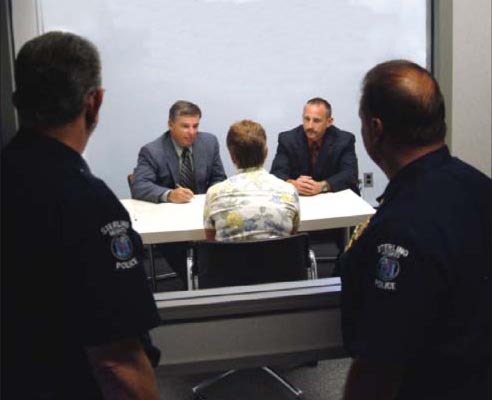 Miranda v. Arizona established a “Miranda right to counsel” during custodial police interrogations, purportedly based on the Fifth Amendment. One problem with the Miranda decision is that the Sixth Amendment right to counsel during “criminal prosecutions” implies the absence of any constitutional right to counsel prior to the commencement of a formal criminal prosecution. A possible solution to this problem with Miranda‘s interpretation of the Fifth Amendment will be offered. The Miranda court derives its asserted Fifth Amendment right to counsel from the provision that “[n]o person shall… be compelled in any criminal case to be a witness against himself.” The court reasoned that someone’s right not to be compelled to make incriminating statements is functionally impossible without an implied right to counsel during an “inherently coercive” custodial interrogation, which usually occurs before the onset of a “criminal prosecution,” i.e. arraignment, when the Sixth Amendment right to counsel kicks in. The Sixth Amendment states, in pertinent part, that “[i]n all criminal prosecutions, the accused shall… have the assistance of counsel for his defence.” The Supreme Court, in Hamilton v. Alabama, held that the Sixth Amendment right to counsel begins in the “critical stages” of a “criminal prosecution” such as arraignment, when certain defenses must be preserved in many states. It appears from a comparison between the Fifth and Sixth Amendments, then, that Miranda‘s implied Fifth Amendment right to counsel is broader than the Sixth Amendment’s right to counsel because it applies during custodial interrogation, an earlier point in the process than the subsequent arraignment, when the Sixth Amendment’s right to counsel begins. But there is a logical problem with this. The Sixth Amendment boldly set forth the rule that one has a right to counsel beginning at arraignment or at some similar “critical time” in criminal prosecutions. If an even broader right to counsel already existed much earlier in the process based on the Fifth Amendment, then what is the Sixth Amendment adding?! Put another way, the Sixth Amendment’s assertion of a right to counsel at a point like arraignment implies that no such right existed prior to that point in the process. It is all well and good to reason that the Fifth Amendment must imply a right to counsel because one’s right not to be compelled to make incriminating statements against himself during custodial interrogation would be functionally impossible without a concomitant right to have an attorney present. However that is only compelling if no other Amendments make a statement explicitly or implicitly about the presence or absence of a right to counsel. But because the Sixth Amendment grants a “narrower” right to counsel during “criminal prosecutions,” it thereby implies that no right to counsel existed prior to that moment, thus negating any interpretation of the Fifth Amendment that reads a right to counsel therein. This is (one of) my problem(s) with Miranda. An answer to this problem is possible because it is not actually true that the Miranda right to counsel is broader than the Sixth Amendment right to counsel. In some instances, the Sixth Amendment right is broader than the Miranda Fifth Amendment right. Where a defendant has been arraigned and released on bail pending trial, he is still at a “critical stage” when the Sixth Amendment gives him a right to counsel. But because he is walking free, he is not in a “custodial interrogation,” and the Miranda implied Fifth Amendment right to counsel is not invoked. At that juncture, Miranda‘s right to counsel is narrower and “more lenient” than the Sixth Amendment’s broader right to counsel. It is possible, then, that an implied Fifth Amendment right to counsel would not render the Sixth Amendment right superfluous. The Sixth Amendment adds on the additional right to counsel in those situations where a defendant is post-arraignment and not subject to any custodial interrogation. Since the Sixth Amendment does add a right to counsel that does not exist in Miranda‘s Fifth Amendment right to counsel, in such situations, it is possible to assert that a “narrower” (in some instances) right to counsel exists in the Fith Amendment as well. The fact that the Sixth Amendment right to counsel is broader, in some instances, than the Fifth Amendment Miranda right to counsel certainly does not prove that there is a Fifth Amendment right to counsel. Many arguments still exist that the Miranda Court was wrong in reading a right to counsel into the Fifth Amendment. But the above-mentioned factors indicate that the existance of a Sixth amendment right to counsel is not dispositive as to the absence of a Fifth Amendment right as well. Picture of Ernesto Miranda courtesy of pbs.org.